The BVM Legacy of Love is alive in the hearts of all who have been welcomed into their circle of friends. It flourishes in the hearts and actions of the global sisterhood working together for the greater good. That circle expanded last fall when President Teri Hadro, BVM and Secretary Kate Hendel, BVM journeyed to Vietnam to learn more about the sister congregation BVMs have come to love, the Sisters of the Immaculate Heart of Mary (IHM), and to join them in the 60th anniversary celebration of the IHM congregation. This growing friendship started more than two years ago when BVM Sisters first welcomed IHM Sisters to reside at Mount Carmel in Dubuque, Iowa, while pursuing studies at Divine Word College in Epworth, Iowa. Since then, IHMs Diem Ngo, Tram Tran, Liem Nguyen, and Tuyen Nguyen have become welcome members of the community. 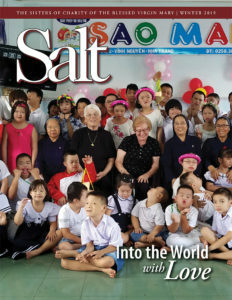 “As we’ve gotten to know them, the IHM Sisters have become very dear to us,” says Kate. The young sisters were happy to share their culture. 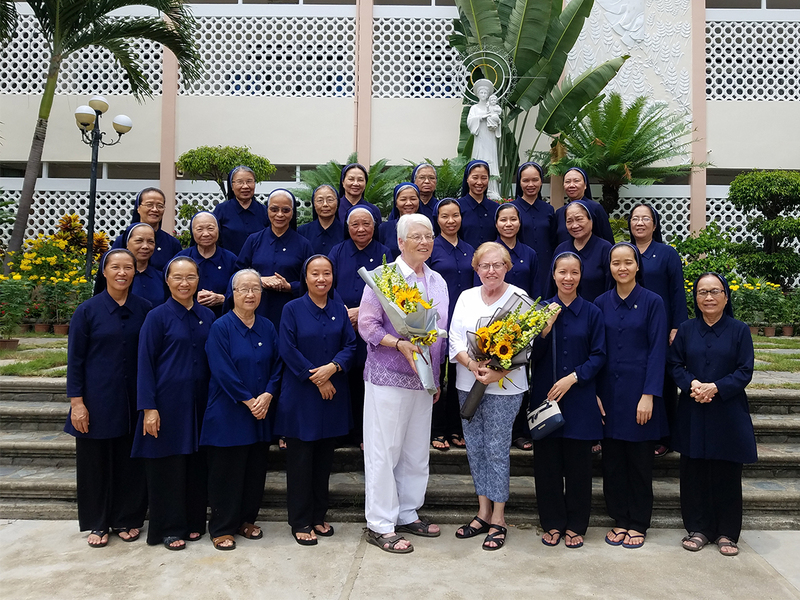 They created the floral arrangements for the 185th anniversary celebration of the BVM congregation, and this past year they invited Mount Carmel sisters to celebrate the Lunar New Year, an important Vietnamese holiday. Diem, Liem, Tram, and Tuyen spent several days preparing their native food, arranging flowers, and practicing dances for the event. The BVMs were delighted to join in the celebration. 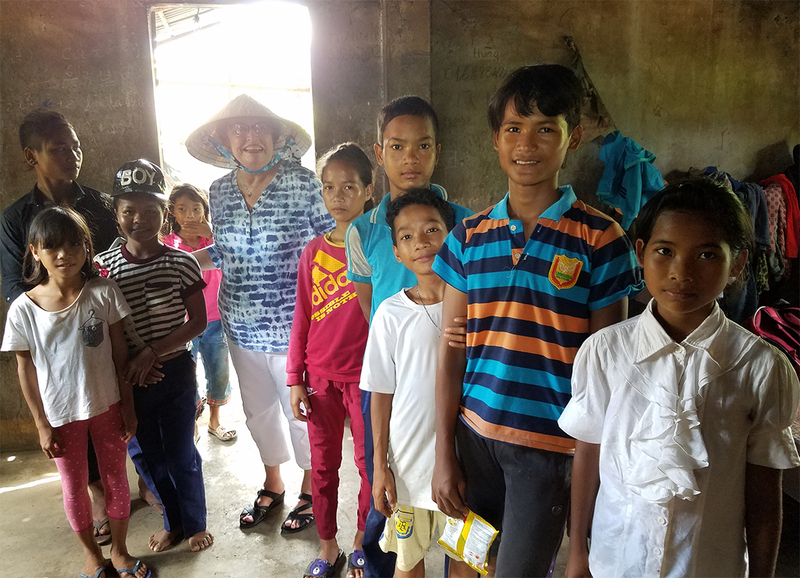 BVMs Teri Hadro and Kate Hendel visit a private school run by the IHM Sisters where they were greeted by laughter, drumming, and dancing. 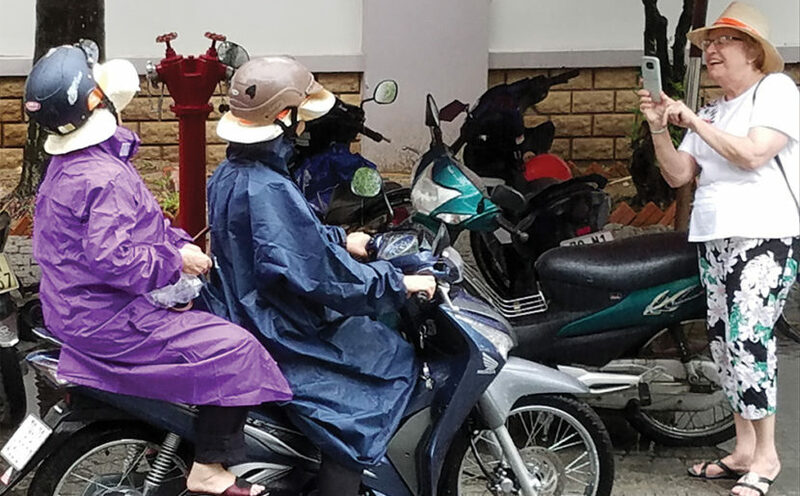 In this spirit of friendship, Teri and Kate boarded a plane to journey to the home of the IHMs in Nha Trang City, Khanh Hoa Province, Vietnam. Getting to Vietnam was challenging. They faced a 24-hour delay in Tokyo because they didn’t have the necessary visas to enter Vietnam. After a quick application process, their journey continued. 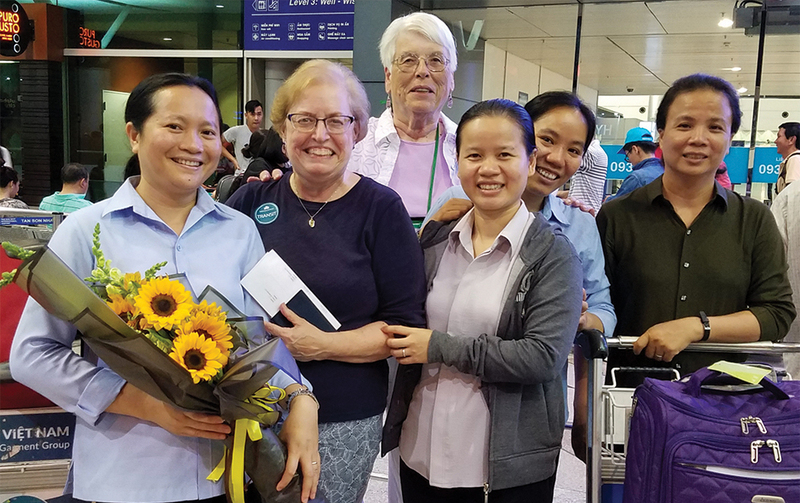 When Teri and Kate arrived in Vietnam at the Ho Chi Minh City airport, they received a warm greeting with flowers from the nephew of Anna Trang Mai, IHM (the first IHM to stay with the BVMs at Mount Carmel). He and his friend relieved Teri and Kate of some of their luggage which contained numerous books, videos and other items sent from the IHMs in the U.S. After an overnight stay in Ho Chi Minh City, Teri and Kate boarded the final flight to Nha Trang where again they were greeted with flowers and a warm welcome from the IHM leaders. 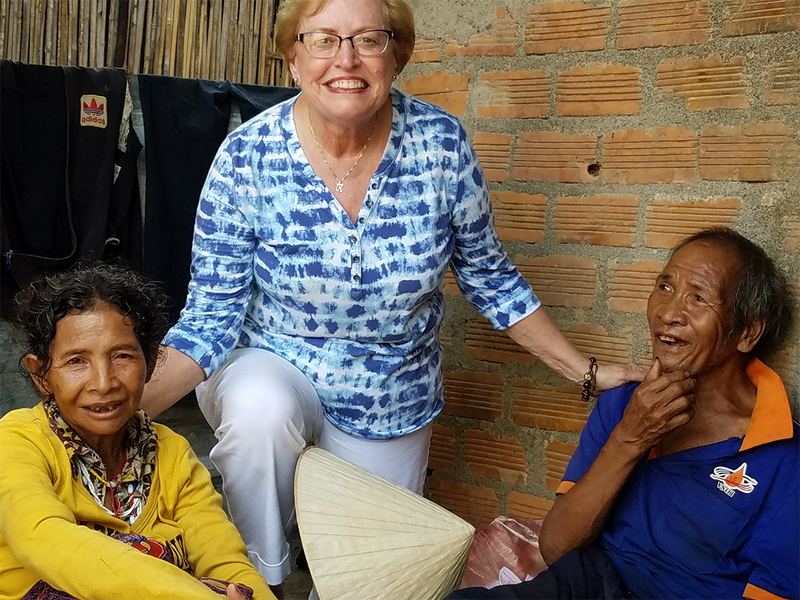 Once in Nha Trang, Maria Goretti, IHM served as their tour guide and led Teri and Kate through the region that the IHMs call home to experience their culture, food, and to visit their missions. Thi, IHM served as their driver. 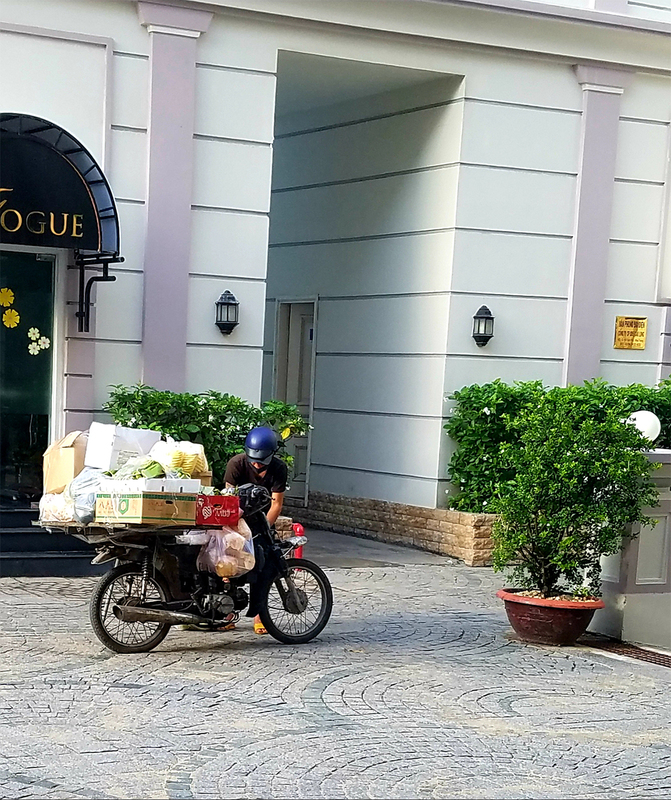 Each experience held new surprises like the number of people and things you can cram onto a motorbike; the abundance of art, music, and dance; the diverse foods; and the importance of symbolism. 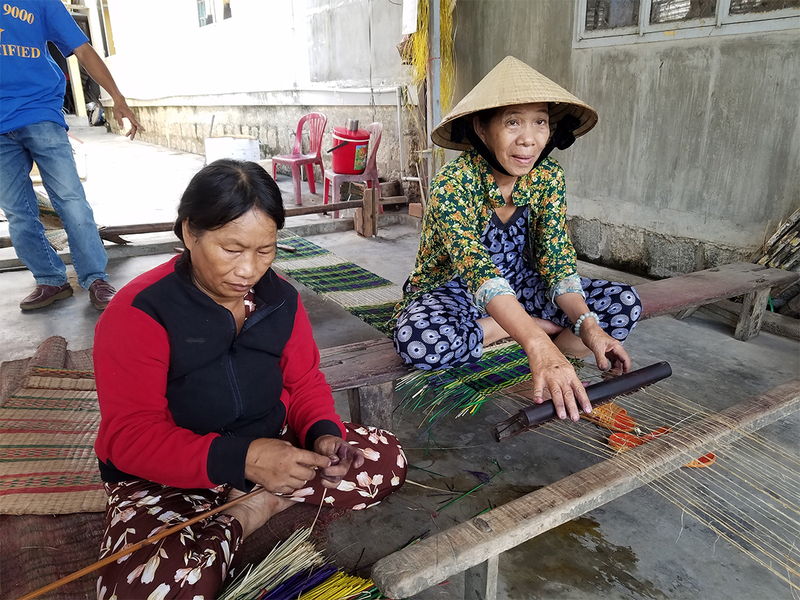 They encountered the natural beauty of the area at Flower Island, the wildlife at Monkey Island, the pristine streets and beaches, and marveled at the artistry of local street vendors who wove mats entirely by hand and with unbelievable speed. The globe became smaller when on one of their stops Kate and Teri encountered a priest in a rural parish. He commented that he was raised in Chicago and that his mother had cooked for sisters in Chicago. Upon further discussion, Teri realized it was a woman who cooked several years for BVMs at Wright Hall, a residence for sisters in Chicago. Beyond the fast-paced motorbikes and the hustle and bustle of the city, the most impactful experience of the trip was encountering the children at private schools run by the IHM Sisters. Serving in a communist country comes with challenges. 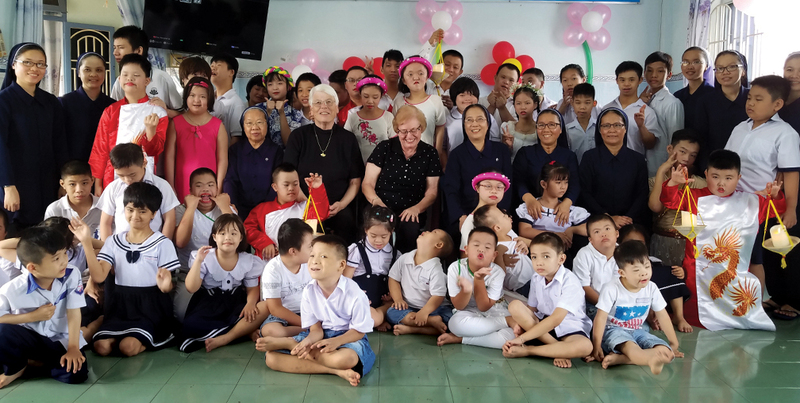 IHMs are barred from teaching in public schools and are only permitted to work with groups that are marginalized by the Vietnamese government such as children with mental and physical disabilities and minorities. 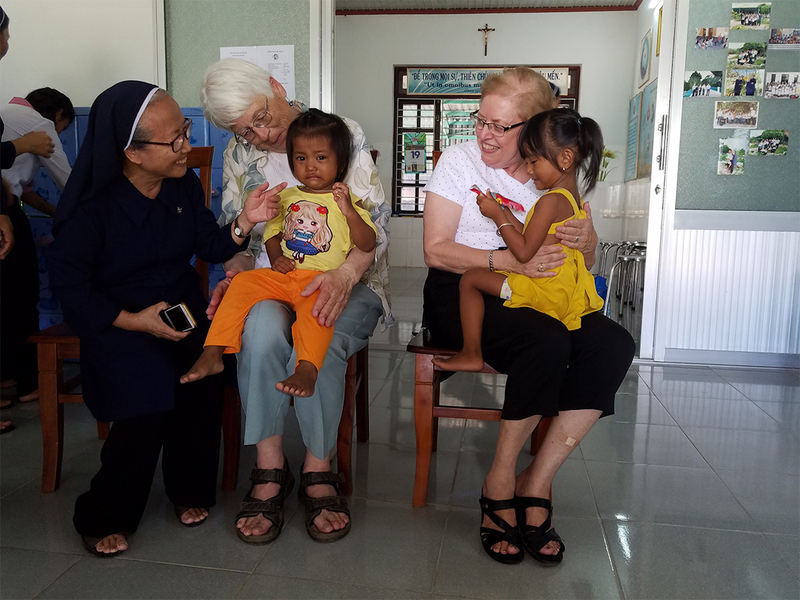 “The thing that touched my heart the most was what the sisters have been able to do for children whom the government deems not worth time and effort,” says Teri. The IHMs serve a dire need to support, teach, and love children who need to know they matter. It’s a service similar to the BVM missions that taught the marginalized children of immigrants and minorities who were deemed outcasts by their society. At every school Kate and Teri visited, the children greeted them with laughter, drumming, and dancing. 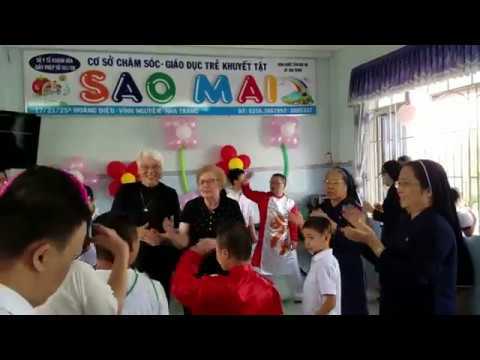 These days of cultural exchange led to the 60th celebration at the IHM Motherhouse in Nha Trang. In front of an audience of 800 guests, Superior General Mary Hoài Ân, IHM took time to thank her BVM friends in English. It was an act that deeply moved Teri and Kate. 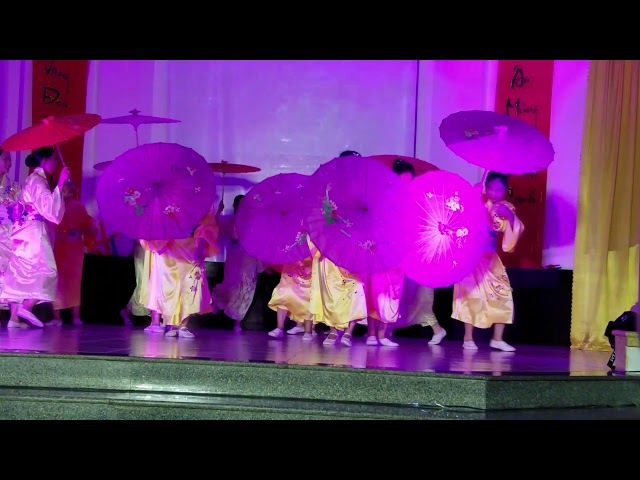 Numerous and stunning displays of music and dancing filled the celebration. 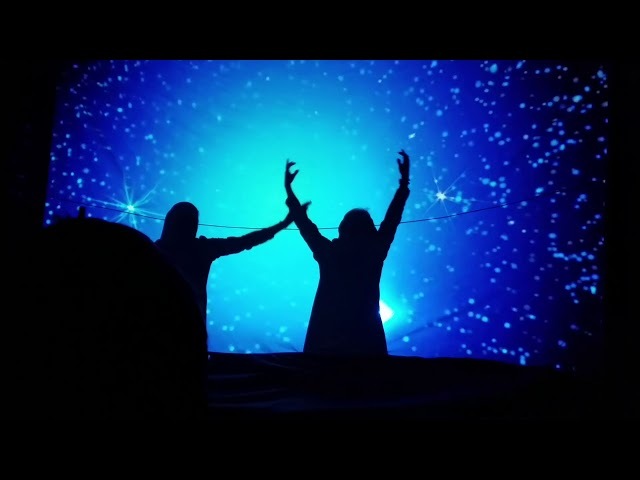 In one part of the program, the IHMs shared the history of their missions with music, shadows, interpretive dance, and images on a large screen. Highlighting small parts of their 60-year history, they told the stories of their missions from Vietnam to Australia. To the astonishment of Teri and Kate, towards the end, the IHMs even featured an image of Mount Carmel, marking the BVMs as a mission of the IHMs. Before leaving, Teri and Kate were asked to speak to the IHM novices. Together, the IHMs, Teri, and Kate gathered in a circle where they discussed the spirit of BVM Foundress Mary Frances Clarke and the BVM core values of freedom, education, charity, and justice. 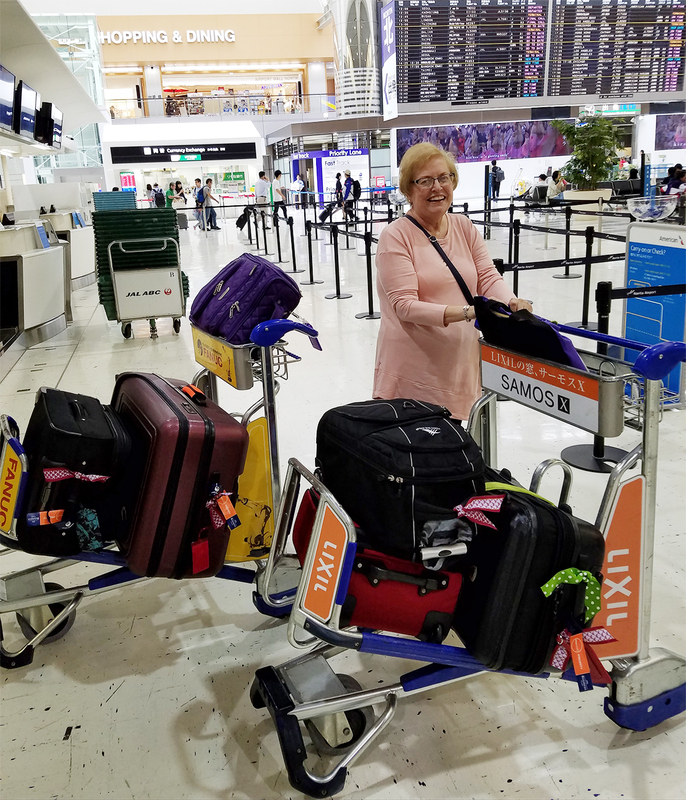 As they left Vietnam, Teri and Kate were met by five IHMs at the airport in Ho Chi Mihn City to guide them from the domestic to the international terminal and to assist with luggage. 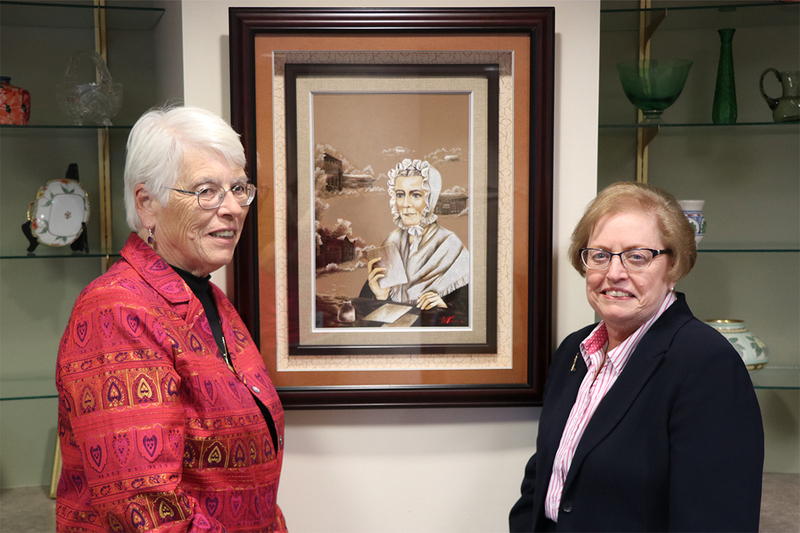 As a token of their appreciation, IHMs also commissioned a silk embroidery of Mother Clarke for the BVMs, but no gifts were the same as the gifts of experiencing a new culture and an expanding friendship. At the airport in Ho Chi Mihn City, IHMs send a final farewell to BVMs Kate Hendel (second from l.) and Teri Hadro (r. of Kate). 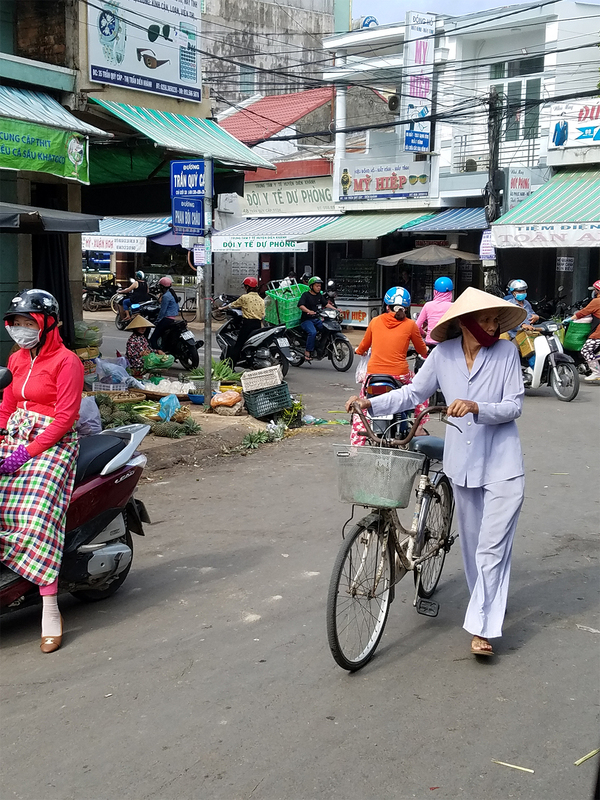 After seeing the impact of the IHM ministries firsthand, the BVM congregation will financially assist the IHMs to help them build a week-long boarding school in Vietnam—allowing children who live in remote areas to attend school every day. Once again, like many schools BVMs opened throughout their 185 years, they are answering the call to assist the IHMs in opening a new school, thus making the IHM vision a reality. The BVM Legacy of Love continues through the growing circle of friends near and far. 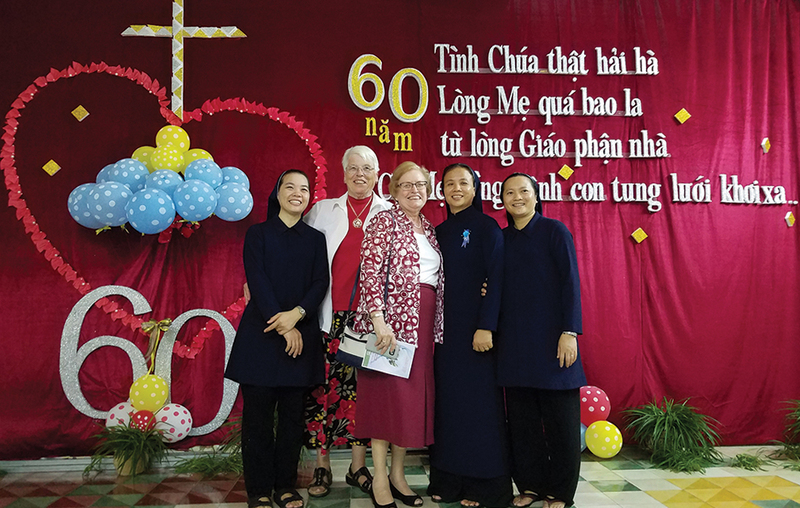 BVMs Teri Hadro (second from l.) and Kate Hendel (center) celebrate the 60th anniversary of the IHM congregation in Nha Trang, Vietnam, on Sept. 17, 2018. 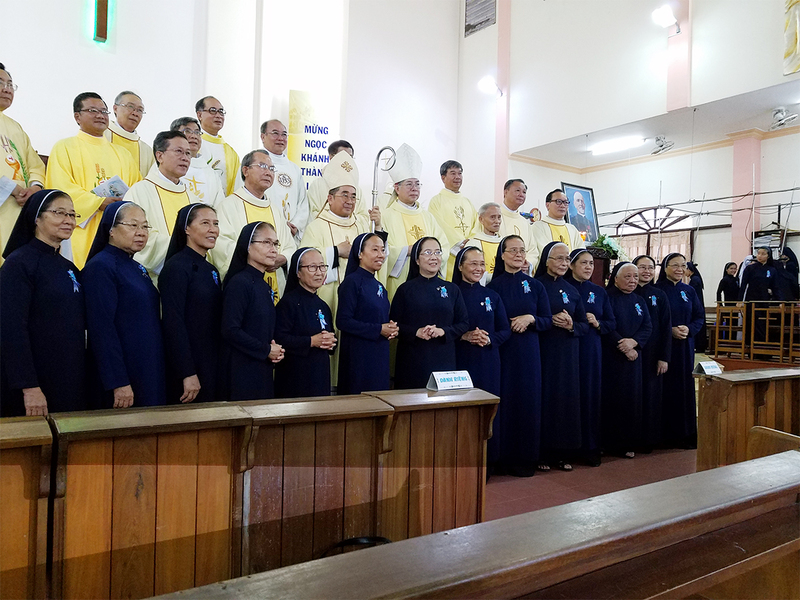 The IHM sisters in Nha Trang, Vietnam celebrate the 60th anniversary of their congregation. 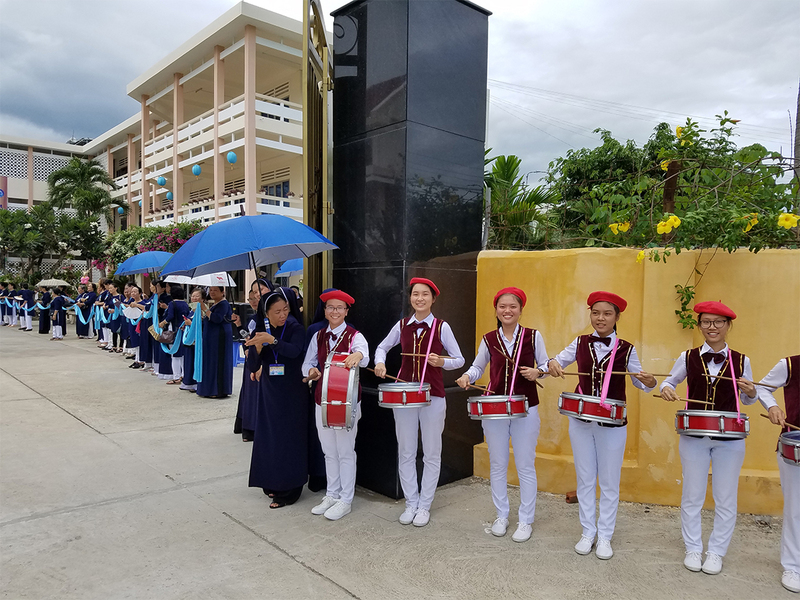 The IHM congregation welcome BVMs Teri Hadro and Kate Hendel to Vietnam. As a token of their appreciation, IHMs commissioned a silk embroidery of BVM foundress Mary Frances Clarke.